The first week of second grade has come to an end and surprisingly, we’ve managed to beat the back to school slump that creeps up on us every August. Toodie was actually excited to meet her teacher, see old friends, and venture into a new world of knowledge. I barely got a kiss goodbye before being scooted out of the classroom! Shifting from a relaxed summer schedule to structured learning usually takes time but she was eager to jump right into things this year. As Toodie grows, so does her curiosity. Within the past year I have witnessed a noticeable change in her willingness to try new things and explore. She’s always been a kid that loves tech, gadgets, gizmos, computers, and robots. That’s how I knew Dash was going to fit right into the family! 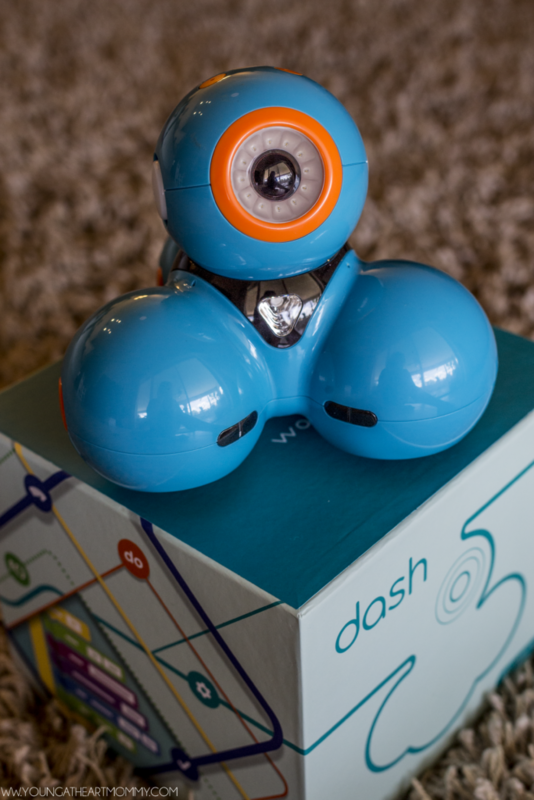 Dash is your child’s first real robot friend, charged and ready to go right out of the box. Created by the Wonder Workshop, this bubbly blue bot is engaging and seriously fun to play with! 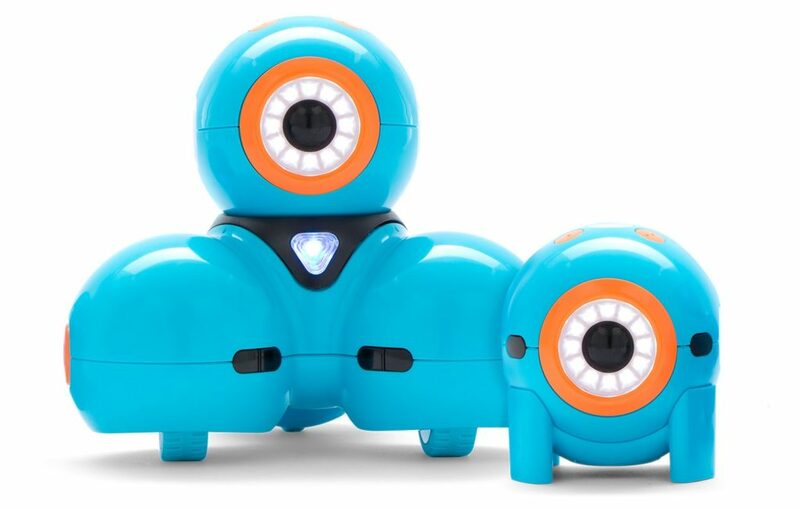 It responds to voice commands, navigates objects, dances, sings, and even acts silly at times. Using a tablet or smart phone, Dash can learn many new behaviors through one of the five free apps available in the marketplace. 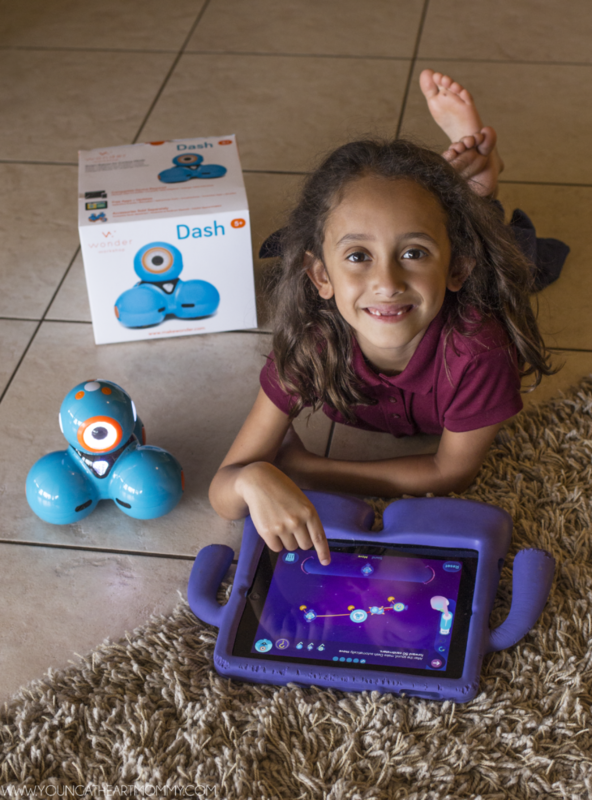 Wonder, Blockly, and the other apps encourage interaction with Dash while making robotics easy to understand. It can be instructed to make animal sounds, follow a set path on the floor, and even change the colors of its sensors. Toodie has really enjoyed programming her new friend and making it repeat everything she says! The other day I was in the kitchen and here comes Dash, rollin’ on in to request a bowl of ice cream. How could I say no? I think she’s starting to use this little guy to her advantage as he learns to interact with the surroundings. You can see Dash in action below. It’s two drive wheels and balance caster enable it to drive forward, backwards, and spin in any way you choose to direct it. Dash is built to inspire and encourage your child’s wild imagination. In addition to the apps, you can purchase other accessories to create new abilities for Dash. These include a smart phone mount, launcher, building brick connectors, bulldozer bar, xylophone and even a pair of bunny ears for extra personality! How do you make learning fun at home while keep your kiddos engaged?